Good news for GOtv customers! 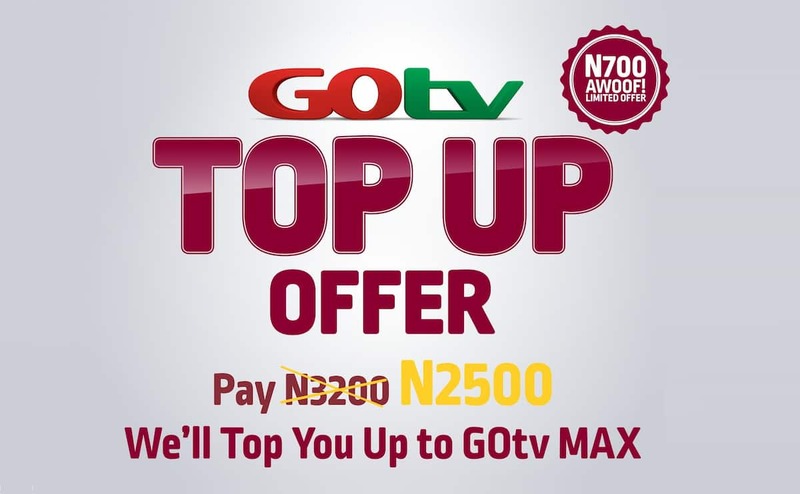 GOtv has launched a great new offer that will see all active and disconnected customers on GOtv Plus, Value and Lite get upgraded to GOtv Max when they pay a flat fee of N2,500 while GOtv ‘tops up’ the rest! 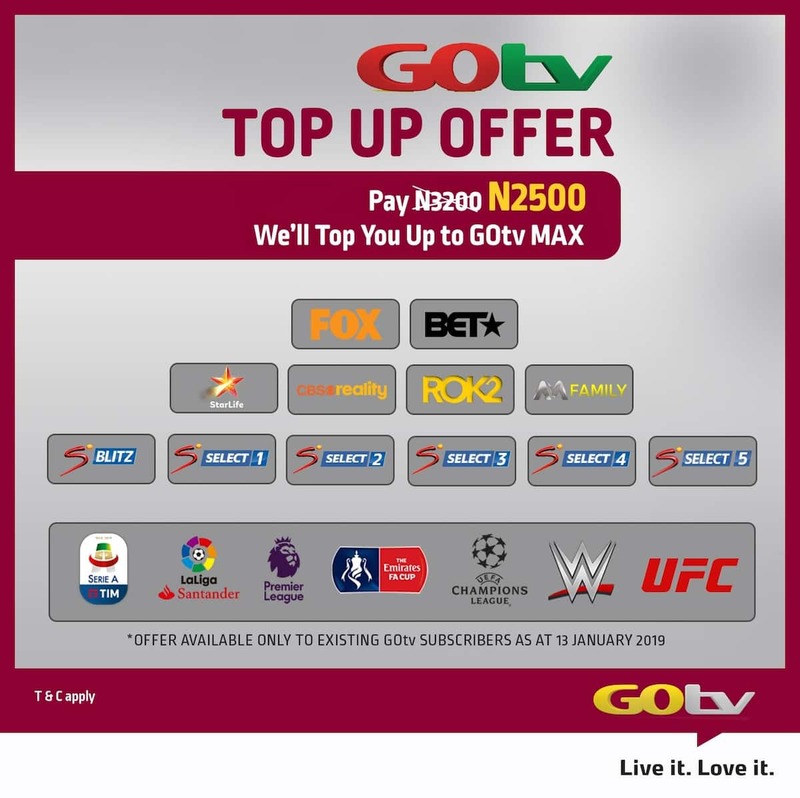 The offer tagged #GOtvTopUp will run from January 15 till April 15, 2019 and will give customers on the lower GOtv packages the opportunity to step up to premium entertainment on GOtv Max. 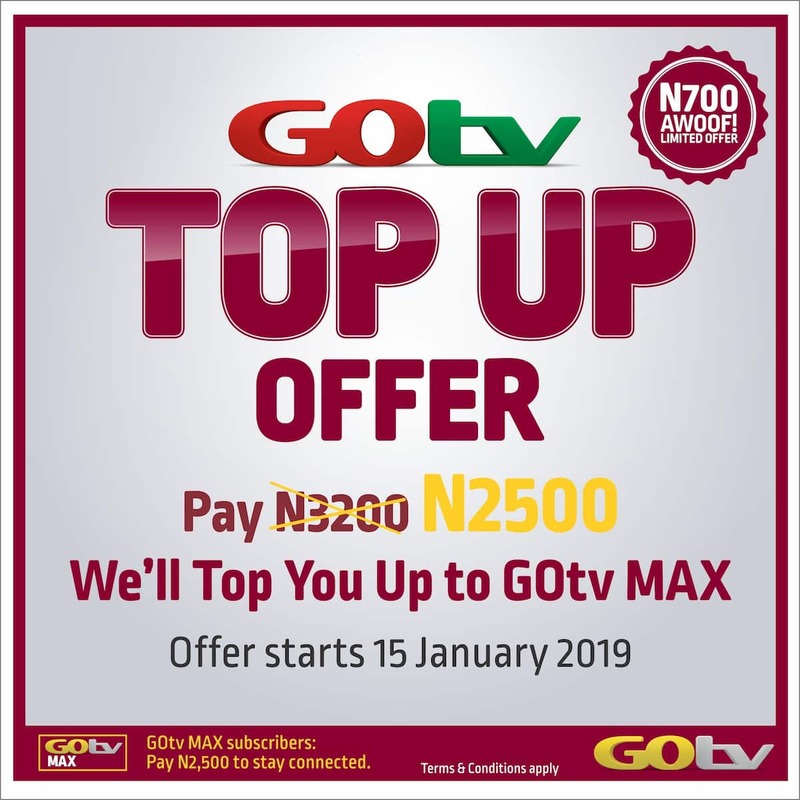 Active and disconnected GOtv Max customers can also take advantage of this limited time offer to renew their subscription for only N2,500. Of course, you know GOtv Max is the super charged package that delivers maximum entertainment featuring all La Liga and Serie A matches live, plus great local and international channels with quality content for the whole family. Furthermore, GOtv Max customers get to watch two times more Premier League matches and select matches from the Champions League and FA Cup. Lovers of telenovelas will be spoilt for choice with heartwarming and suspense filled series such as Woman of Steel, This is Fate, Married Again, and Silver Lining on Telemundo and Zee World while the hottest series and reality programming including Empire on Fox Life and Evidence of Evil on CBS reality. It’s more entertainment for kids on GOtv Max with new episodes this month of their favorite shows such as Fancy Nancy Clancy on Disney Junior and SpongeBob SquarePants on Nickelodeon. For more on the #GOtvTopUp offer and programming on GOtv Max, please visit or follow @GOtvNg on and Instagram.